Head Neck Pathol. 2009 Sep; 3(3): 252–259. Few neoplasms are unique to the sinonasal tract, but sinonasal undifferentiated carcinoma and olfactory neuroblastoma are malignant tumors which require unique management. Due to the rarity of these tumors, practicing pathologists are not always aware of their distinctive clinical, radiographic, histologic, immunohistochemical, and molecular features. These cases are frequently submitted for consultation, further suggesting the diagnostic difficulties inherent to these tumors. 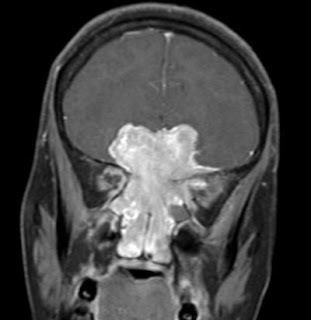 Specifically, olfactory neuroblastoma is a neoplasm that can histologically mimic many tumors within the sinonasal tract, making recognition of this tumor important, as the management frequently requires a bicranial-facial surgical approach, a trephination procedure which can be quite technically difficult and challenging to achieve a good result. The management is therefore quite unique in comparison to other sinonasal tract malignancies, setting it apart diagnostically and managerially from other lesions.